At several events earlier this year we previewed integration between Cortana and Power BI, demonstrating how getting insight from information could be made easier than ever before. Today, we’re excited to announce the public preview of this integration between Cortana and Power BI. 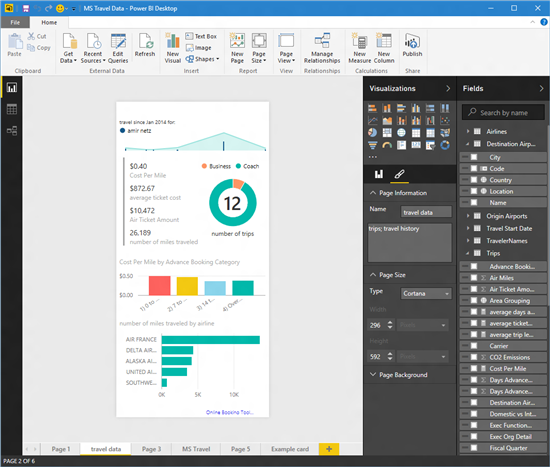 By integrating with Power BI, Cortana now works seamlessly with custom business analytics solutions to enable anyone to get answers directly from their key business data. And that’s not all! 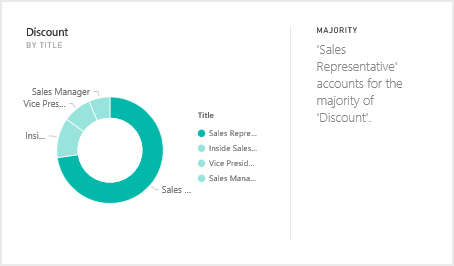 Today we’re also making available the Quick Insights feature for Power BI. This new automated insight discovery capability makes finding insights hidden in data even easier. 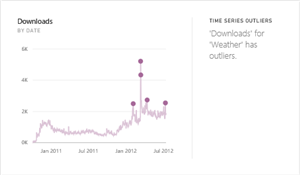 Quick Insights in Power BI allows anyone to search their data for outliers, trends, and other potentially interesting insights to get started with deeper analysis of their data. One of the key ways Power BI enables more people to connect with and gain insight from their data is our natural language data search feature, Q&A. Now these Q&A capabilities are helping Cortana to intelligently reason over the data you have access to in Power BI and provide rich data-driven answers to your questions. 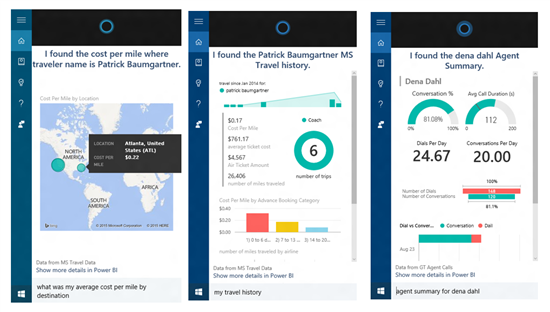 Combined with the Cortana Analytics Suite, this opens up amazing new opportunities to use Cortana to enable your business, and your customers’ businesses, to get things done in more helpful, proactive, and natural ways. By utilizing Power BI’s data visualization capabilities, answers can range from simple numerical values (“revenue for the last quarter”), charts (“number of opportunities by team”), maps (“average customer spending in California by city”), or even complete reports from Power BI all provided directly from Cortana. Potential answers are either determined by Cortana on the fly directly from the data, or by using reports already created in Power BI that help answer a question. 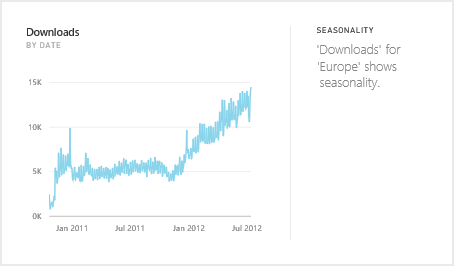 To further explore an answer, users can simply open a result in Power BI. Enabling data in Power BI to be accessed by Cortana is a simple process – in fact all you have to do is pick a data source in Power BI and select “Enable Cortana to access this dataset”. After that any user who has access to the dataset in Power BI, via regular Power BI sharing, groups and content pack features will be able to get answers from the dataset in Cortana in Windows 10. Since Cortana uses Power BI Q&A to help answer questions, making sure your data works well with Q&A also helps Cortana provide better answers. To help simplify this, Power BI Q&A has introduced new features to use reports in Power BI as answers. In Power BI Desktop you’ll find new options to set the size of a sheet to match Cortana and to provide both primary and alternate names for sheets. This allows you to create custom Cortana answers using the full capabilities of Power BI Desktop. To add more power and flexibility, when selecting a report sheet as an answer, Cortana will still apply other filters to the data derived from the question and applicable to the dataset. For example, for a report sheet with “travel data” saying “Patrick’s travel data for this year” will select the travel data sheet as a result, and then filter the result to Patrick and this year, based on the underlying data. If a filter in the sheet is set to require a single selection, then Cortana will only use the sheet as a result if one and only one member of that filter is specified in a user’s question. 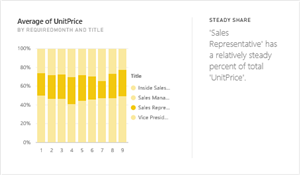 These new answer capabilities are available both in Power BI Q&A and Cortana. Like I said above: that’s not all! 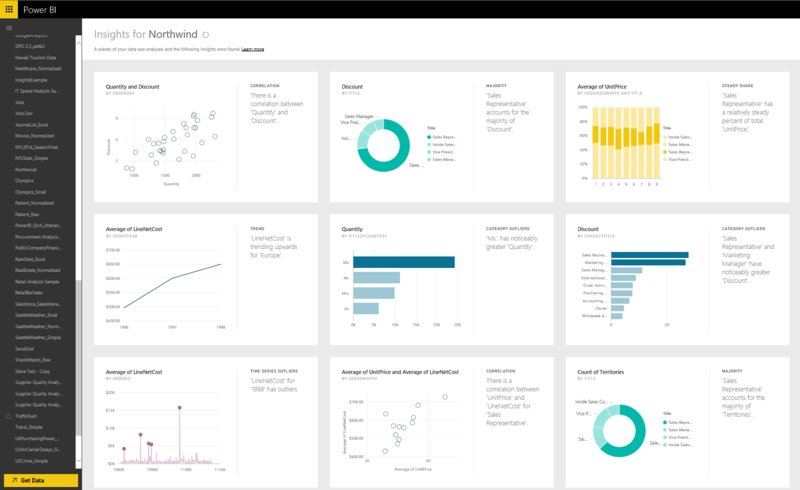 In addition to helping you get answers more quickly and easily using Cortana, Power BI now has new ways to help you find insights hidden in your data. 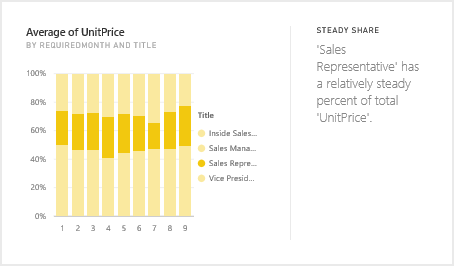 Power BI’s new Quick Insights feature allows you to run a variety of analytical algorithms on your data to search for potential insights with the click of a mouse. 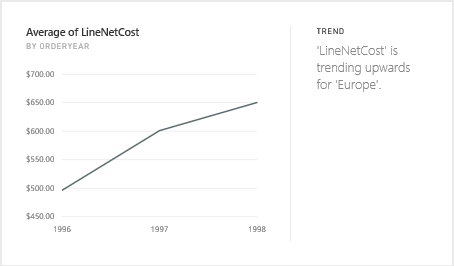 Through a partnership with Microsoft Research, we’re honing a growing list of algorithms to discover and visualize correlations, outliers, trends, seasonality, change points in trends, and major factors within your data, automatically, within seconds. To scan your data for potential insights all you have to do is select “Quick Insights” for a dataset uploaded to Power BI. 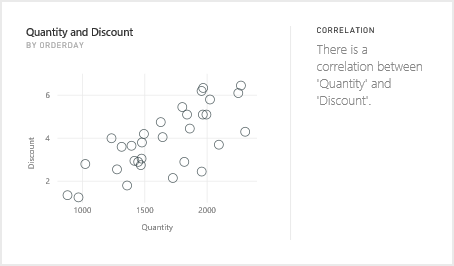 For 10-12 seconds Power BI will iterate across your data searching for subsets of data you may find interesting. 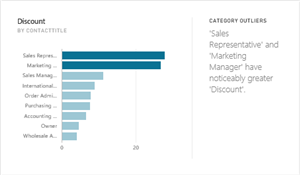 If we find something that meets the criteria of one of our insight categories we visualize it, along with any other insights we’ve found, for you to browse. A description of each potential insight and an appropriate visualization of the data is provided to help you understand if it is indeed interesting. If you like something you see you, can pin it to a dashboard with one click. What types of insights can we find? The key to finding insights is how Power BI efficiently iterates over different subsets of data within your model while applying a sophisticated set of algorithms to each subset to discover potentially interesting information. By default, we will scan as much of a dataset as possible in an allotted amount of time, while in the future we’ll allow you to control what portion of your data we should focus our computational resources on. Discovers cases where all values of a measure for a given category are very close to each other when plotted against another dimension. 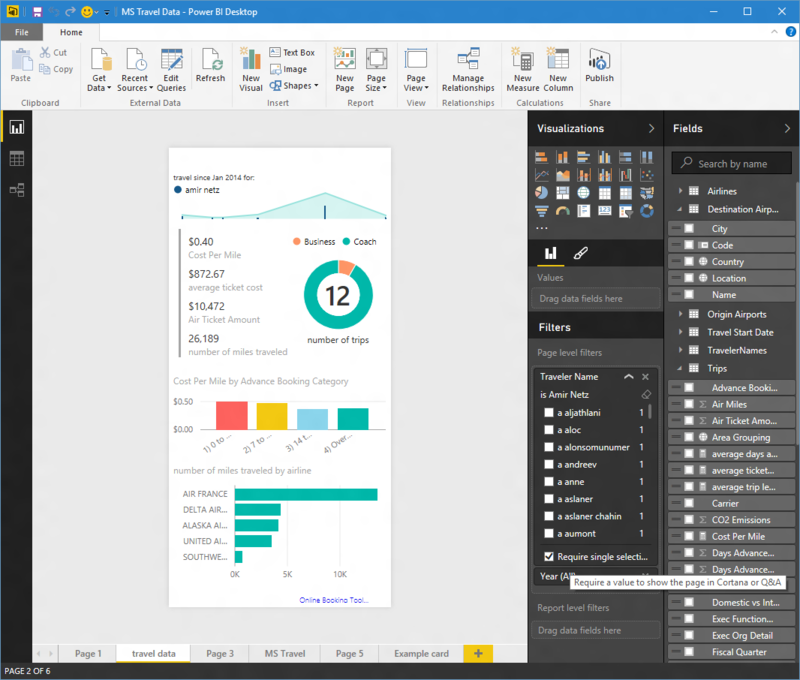 Like everything in Power BI, we’re able to leverage the cloud to bring new capabilities to users quickly – and more importantly – to improve them quickly. 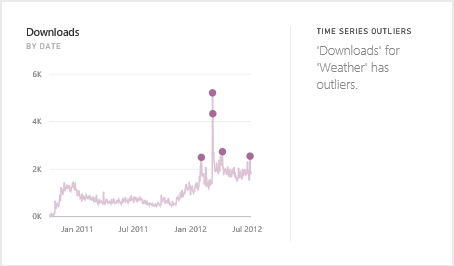 We’re excited for you to ask Cortana questions about your Power BI data and use Quick Insights on your datasets. We’re even more excited to get feedback from you to help us to continue to hone our algorithms and experiences to make discovering insights and getting answers even easier and faster. We would also like to invite you to attend the inaugural Microsoft Data Insights Summit, a two-day event for business analysts to connect with each other and with industry experts. We anticipate 1,000 business analysts will join us in Bellevue, WA March 22-23 to discover best practices, new tools, and new ways to get things done. Visit datainsightssummit.com to register. Update: Both the Cortana integration and Quick Insights features are being deployed today. The Cortana team also has a deployment to enable the feature publicly. These are expected to finish mid-afternoon (PST) and the feature becomes available after that. Documentation will also go live shortly with instructions on how to get started.